About client: Ranked in the top two per cent of universities globally, Macquarie is renowned for excellence in interdisciplinary research and teaching, unique approach to learning, highly skilled graduates, and first-class facilities. Macquarie University required digital marketing tool to market their sport’s facilities to prospective students as well as general public. Rapturous Media won the tender, and created a stunning virtual tour showcasing the interior and exterior of the university’s Sport and Aquatic Centre. 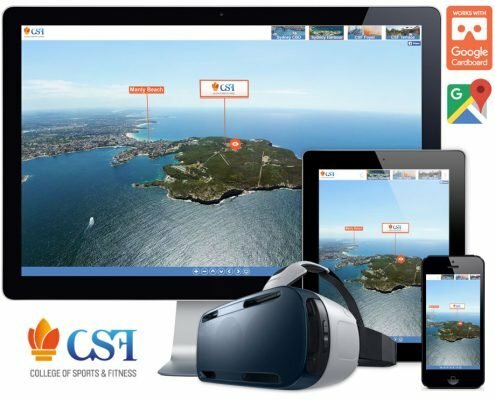 The tour features high-resolution HDR photography, 360-degree interactive photos, clickable hot-spots and pop-up windows containing more information for potential clients about the facilities and services. We developed a user-friendly interface specifically for the university, custom-designed to match their branding. It presents users with a seamless, app-like mobile experience, and is integrated with the university’s social media accounts. Feedback from the university has been extremely positive, and the tour has become an invaluable tool for their sales and marketing activities.